February is the month of love and instead of love for people, I wanted to share a passion of mine. Today is aerial sling. A conversation lead to one thing, which lead to another thing. Soon enough I was signing up online and showing up an hour early to a brand new class. I didn’t really know what to expect. I am not a great writer. I can’t describe the feeling of being weightless and flying through the air. The words I come up with doesn’t do it justice. Suffice to say I love it and can’t get enough. When I love something I want to write about it and share it, so that you too can hopefully get inspired and maybe try it. As I can’t describe it well, I’m just gonna cover some basic things that I have discussed that focus less on the feeling and more on the questions. The first question I had was where do I find a class. I had a favorite yoga teacher talk about a class she was taking, which lead me to another teacher. She walked me through UW Health’s mess of a website to find my first class. Honestly without her directions there’s no way I would have found the class. From there it was a matter of just showing up. Which I did, again and again. A few months passed by and the teacher informed me of another class on a different day. So I signed up for that. After that both teachers informed me a classes they were holding at a different location and I joined those classes September 2018. Where can you find a class? That depends on your city, google aerial yoga for your area and see what comes up. 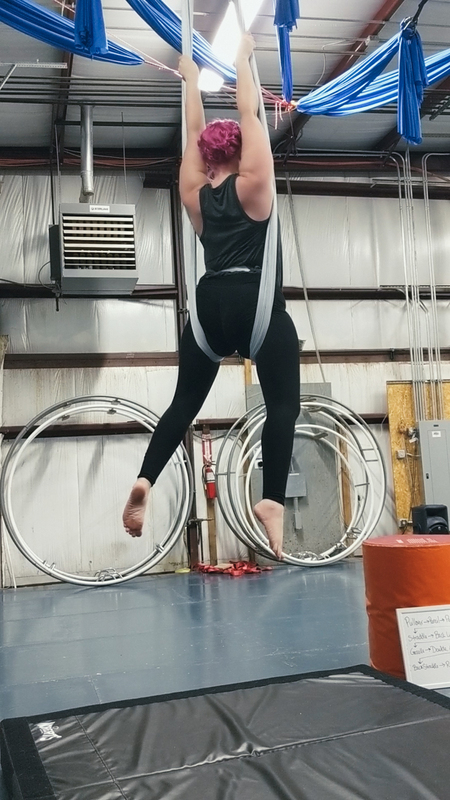 Classes I am currently taking are hold at my local circus space, sling in particular is taught by Brenda Smage (she’s been my favorite teacher since I took her slow flow class back in 2017). Those first few months of classes allowed me to learn the very basics of hanging the hammock and the motion of movement. It is very easy to get turned around when your upside down. Swinging is my favorite thing to do and I wish I had been brave enough to get someone to take a picture of me swinging in the hammock, reading my book. I think doing that made me want one in my home all the more. My first roll down was terrifying, but also completely thrilling. That is something I want to point out, I started originally doing aerial yoga. It combined things I did in yoga, like warrior I, II, III with movement in the sling. I did that from February (2018, so I’ve now been at this for a year!) to August. Then switched to full sling class in October. The beginning classes got me comfortable and over my fears in an environment that was less intimidating that the circus space. Because let’s be honest, the circus space is intimidating. 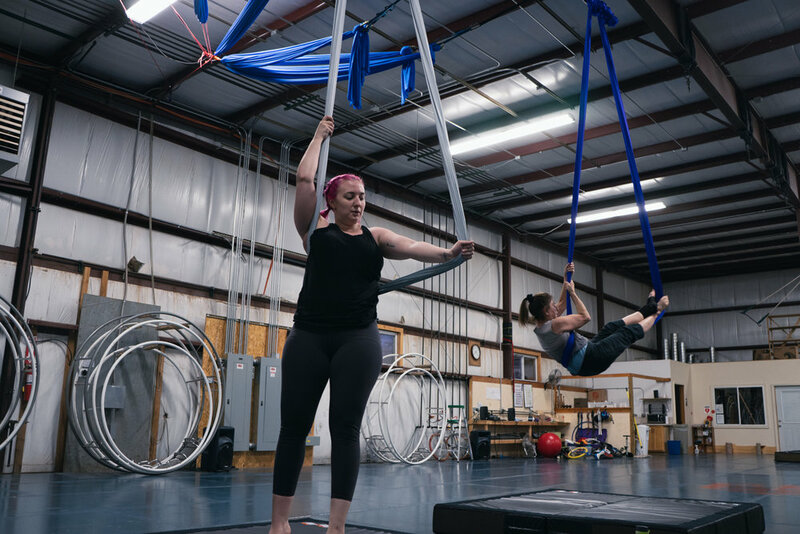 Moving from aerial yoga to aerial sling, what’s the difference? As mentioned the yoga classes incorporated a lot of things I already knew but added some flight to it. Shavasana in a sling is the best type of shavasana there is. Unless you get motion sick, it’s a awesome place to rest. Sling however, gets a lot harder and becomes more about the dance. Before arm strength matter little to the classes, now my strength is not only important but key to moving around and holding myself up. You do build a lot of that strength from the class itself. Repetition of the movements and weekly classes help you build up. So technically you don’t have to do extra’s outside of class. I choose to because I want to do more and am easily discouraged with my slow pace. The beginning of the roll down. The end of a roll down. At least this version. Pull yourself up and get brave enough to let go. Holding yourself up with arm strength. About to jump up and lift myself over. It's hard. Flying with just one leg. A semi comfortable resting pose. A question I've been asked a few times, i one I am not sure how to answer. Does size matter? No but yes… is the answer I’ve come up with. At least in my experience - the rigging set up is professionally done and is good for hundreds of pounds. The sling is made of high quality material and you never feel unsecured, except in your head. Your head is a huge part of this and it will hold you back. This is definitely not for everyone but I don’t think your size should stop you from trying. 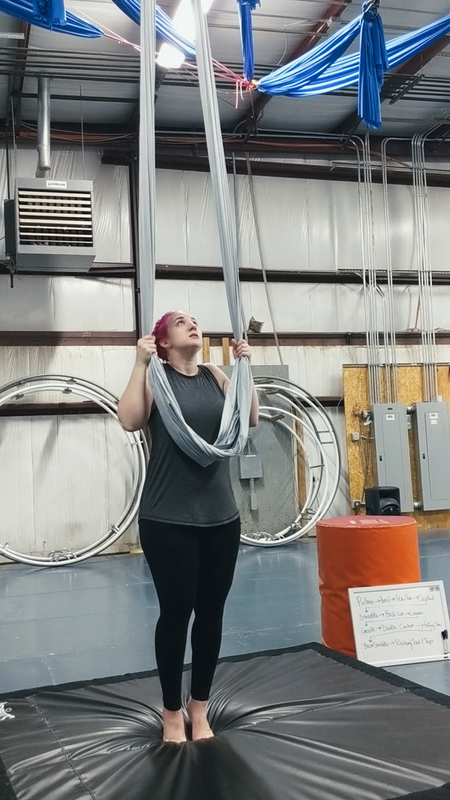 That said, this is not an easy thing to do, which is why I mentioned that there’s a difference between aerial yoga and aerial sling. One could be something you love and the other something you hate. It’s all very dependent on your situation, teacher, and environment. If I had immediately headed for the circus space I am not sure I would have lasted. It’s an open space with multiple classes being taught at the same time and for someone who is very shy, that is a very intimidating situation to walk into. My advice is to be brave and find a really good teacher you trust. As well as trust your body, it will listen to what you ask of it. I also want to mention bruises. I bruise excessively easy and walk away from every class covered in them. My thighs, whenever wrapped, have dotted bruise lines where the fabric sits and most times it’s not comfortable to be wrapped up in the sling. There shouldn’t be pain and if there is, I recommend getting out of it and talking to the teacher but it’s definitely a sensational feeling (something my teacher says a lot! You always know it’s gonna be a good one when the word sensational comes up). I’ve also gotten fabric burns dozens of times. It’s slightly painful but when your moving fast, friction happens and skin rips. Taking care of yourself before and after class is important. Proper warm up, a little arnica gel, and lots of belly laughs will make a huge difference. The important part is to have fun. And as I said earlier... swinging is quite literally the best thing ever. Day 58: Picture is outside in a parking garage where I was an hour early to my first class of aerial yoga. Minor reference, you wouldn’t know from the picture the amount of tension I was feeling. Day 72: Picture taken between the parking garage and the building where the class was, after class was over. I was feeling good but definitely not brave. Day 94: A little brave, actually took a picture in the building. Of course, I was also an hour early to the class and was sitting in here trying to remember to breath. Reflections - February: specifically mentioned that I was taking aerial yoga and that I had been to three. Also mentioned that the bruises were worth it and a year later they still are. Day 97: Aerial show, my first time attending on. Day 114: Not always brave enough to take the camera in, but the outside puddles were pretty awesome. Day 138: Second aerial show. Absolutely loved it. Day 220: Photo of me in class before class, early as usual but finally acknowledging that this thing makes me happy. Day 274 and 276: My first time posting photos of what I was doing. Day 299 and Day 339: Two more class photos. Day 353: My last class of the year. Flying is a beautiful thing. So what do you think? Is this something you would ever try? Do you have questions, that I didn’t think to answer? 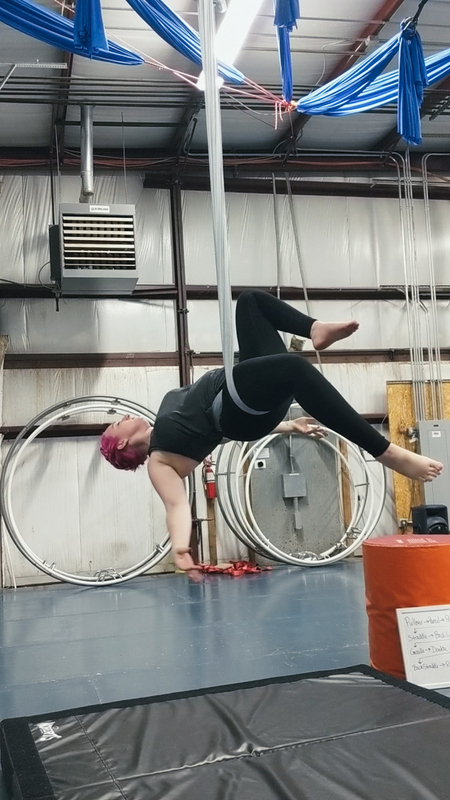 Next week I’ll share about another aerial class I am taking. Cheers!